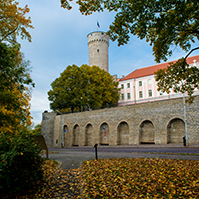 The open Toompea Castle, many concerts, meetings with MPs and seeing their offices attracted around 3,500 people to the Riigikogu Open House which took place yesterday. 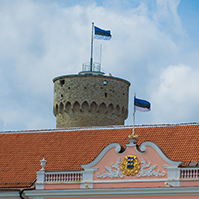 “Visitors started to gather on the square in front of Toompea Castle before the opening of the doors, and the Riigikogu building was filled with curious visitors until the evening,” said the Secretary General of the Chancellery of the Riigikogu Maria Alajõe. A meeting was held in the Plenary Hall, with the President of the Riigikogu Eiki Nestor, long-time MP Mart Nutt, Editor in Chief of magazine Akadeemia Toomas Kiho, and student of political sciences Indrek Lepik speaking on the role of the parliament. Andrus Ansip, Kadri Simson, Neeme Suur, Liisa Pakosta, Inara Luigas and Marko Mihkelson met and talked with people in the cafeteria of the Riigikogu. The quiz “The Parliament and the Republic of Estonia throughout 95 years” was won by the Riigikogu team consisting of Remo Holsmer, Aivar Riisalu, Lauri Vahtre and Rainer Vakra. They competed against the teams of five schools: Saku Gymnasium, Viimsi Secondary School, Tallinn Secondary Science School, private Audentes School and Gustav Adolf Gymnasium, as well as the team of the Chancellery of the Riigikogu. The best entries of the national 2014 School Film competition were screened in the Conference Hall. The prize of the Riigikogu went to the film “Heaven and Earth” by Läänemere Gymnasium. 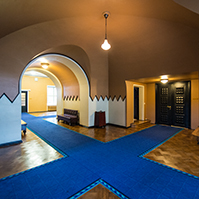 700 visitors climbed the Tall Hermann tower and over 800 took part in Estonian, Russian and English language tours of the building. There were visitors from the Netherlands, Germany, Spain, Finland, Latvia, Lithuania, Russia, Sweden, Australia, USA, United Kingdom, Italy, and Kenya. The day was filled with music, just like a birthday should be. Märt Agu taught dance moves in the courtyard – ready for the Dance Celebration this summer. Youth bands performed at the Commander’s House, and the birthday ended with the concert of Tõnis Mägi and Estraadiraadio in the courtyard of the Castle. 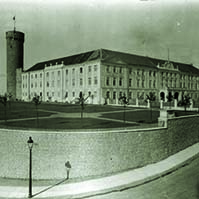 The first representative body elected by the independent Estonian nation – the Constituent Assembly – convened in Tallinn on 23 April 1919. 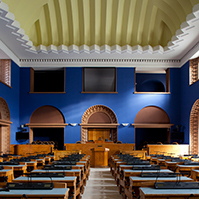 The Assembly functioned as a parliament, passing the Declaration of Independence, the Constitution and the Land Act, and solving issues of vital importance for the Republic of Estonia. 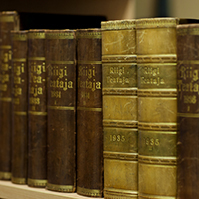 The decisions of the Constituent Assembly formed the foundation of the Republic of Estonia.